I have this odd fondness for vintage circus art. While I can’t really explain it, I mostly think I like vintage posters in general and old photos. By far the strongest influence on today’s paper doll outfit was my circus Pinterest board. Also, like my Ancient Greek fantasy gown from Tuesday, I realized I haven’t done much Circus inspired stuff since my Marisole Monday & Friend’s set from 2014. Several years ago, my National Novel Writing Month project involved a circus. I never finished it, but that’s okay. Is anyone doing NaNoWriMo this year? I usually do, but I confess I’m not this time. 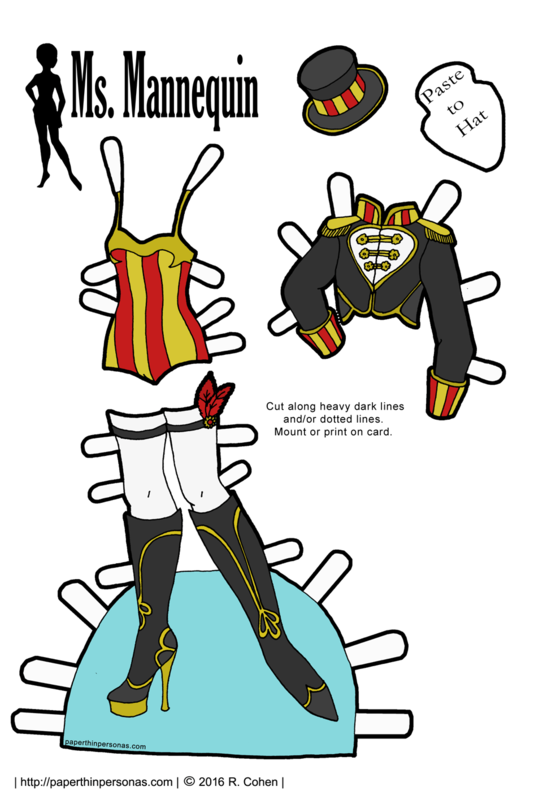 Anyway, I think this is the sort of circus outfit that is probably worn more often by burlesque dancers than actual circus performers, because I don’t think you can do trapeze in those boots, but then again, I don’t know much about actual circuses or their performers. Let’s be honest, here. Still, I think there’s a lot of interesting things you can do visually with circus imagery. Meanwhile, what do you think of today’s paper doll outfit? Let me know in a comment! And if you’re interesting in what happens “behind the scenes” then join Patreon. There’s a whole different blog devoted to all things “backstage” there. Even though I like the outfit, I’ll admit I’m not much of a circus fan. Not a big fan of clowns. I’m also doing NaNoWriMo this year, working on the final draft of last year’s project. Just not as far as I’d hoped to be by this point. I am learning a lot of people aren’t clown fans. NaNoWriMo is challenging, isn’t it? I’ve won a few years and lost a few years. I love circus themed things, though I’ll admit I’m not fond of clowns. But that is a really pretty outfit. I’m doing NaNoWriMo and writing a steampunk novel. Thank you. Oh, a steampunk novel sounds like fun. I like your sets (both the Marisol and the Ms. Mannequin) because the designs have that vintage feel. I think that the boots could be worn at the circus by the sign-girls, or a female ringleader. Never underestimate the power of boots! I never underestimate the power of good boots. Believe me. yes! the boots! the booooooots!!! i share the horror for clowns, but i do love circus aesthetics otherwise. and i pretty much wrimo every year whether i log in to register or not (this year i logged in). I like clowns. But it helps that I’ve been around them my whole life. Technically, you could trapeze in those boots, just a solo routine, no flips under the bar. They’d actually probably help you stand on the trapeze better. If you get anyone else involved, it becomes a safety hazard with the heals and all. I have seen a performance in boots before, but they were flats. Yeah, I don’t get all the clown fear. I have known professional clowns and they were always very sweet people. Since I know you grew up around circuses, I will bow to your experience on the trapeze thing.